The lodge has been specially designed to be carbon neutral and, thanks to its eco design keep visitors snug during the winter months. Solar panels assist the supply of electricity. 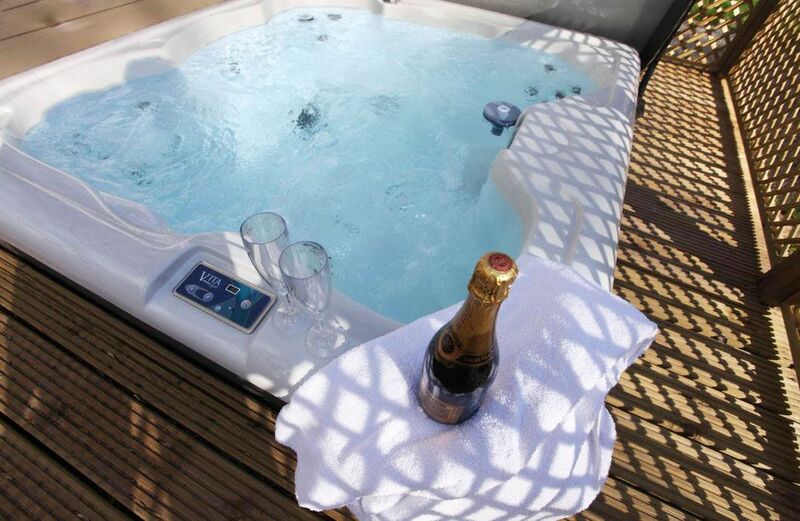 One of five luxury 5 AA star self-catering lodges we offer, Wakes Hall Farm offers dreamy escapism deep within the rural seclusion of north Essex near Wakes Colne in the breath-taking Colne Valley. Endymion Lodge offers the ultimate bolthole for couples or a family of four. Our oasis of five-star luxury is tucked away in an ancient meadow in undulating countryside, where in decades gone by heavy horses, cattle and sheep would have grazed. Endymion Lodge was made for making memories. You’ll approve of the well-equipped kitchen, the very best of open plan living, the sumptuous en suite bedrooms and the state of the art technology. 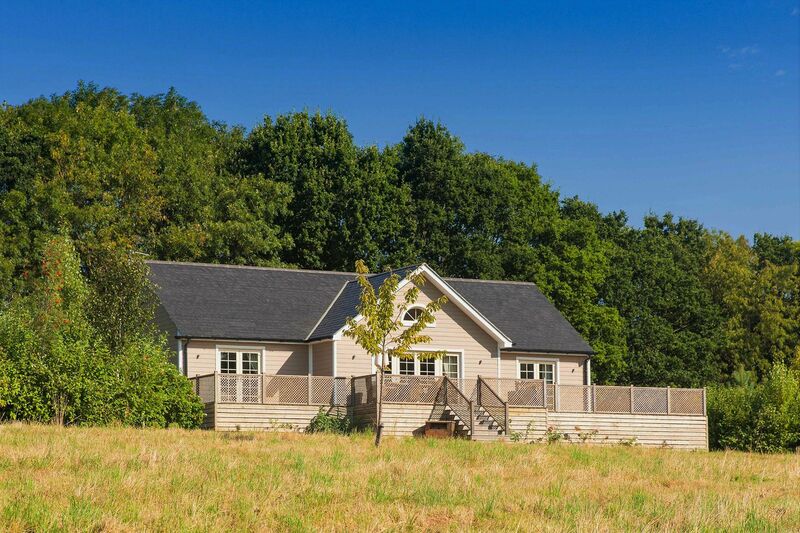 Our purpose built holiday lodge is approached by a mile-long private driveway through meadow land and woodland. Although you’ll feel completely disconnected from the rest of the world, the wealth of attractions on your doorstep will leave you spoilt for choice. Wakes Colne is just a stone’s throw from the historical viaduct at Chappel where there is a shop and post office and a picturesque pub beside the River Colne that serves locally brewed beer. The other lodges we offer at Wakes Hall Farm are Campion Lodge (sleeps 2), Brook Lodge (sleeps 2), Woodbell Lodge (sleeps 4) and Ransom Lodge (sleeps 4). Group bookings are welcomed. 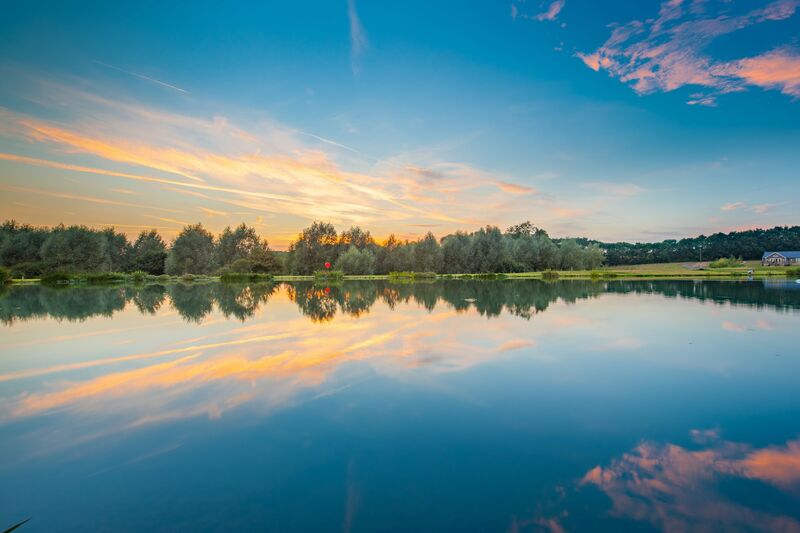 So, whether you’re celebrating a special occasion, or just fancy a few days away from the hustle and bustle, why not unwind at Endymion Lodge in the tranquil beauty of the Colne Valley? 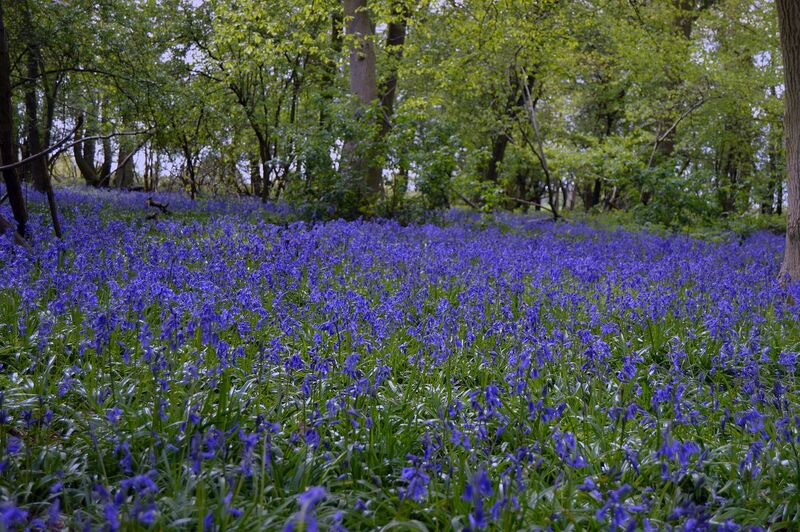 There are many reasons to be wild about Essex. Just a short distance from the capital, yet worlds apart, over 70% of the county is classified as rural – a peaceful patchwork of market towns, timbered villages and tiny hamlets linked by country lanes where all is quiet and slow. Wakes Hall Farm is located in countryside only one mile from the village centre of Wakes Colne and Chappel in the Colne Valley. Chappel shares a Post Office, The Swan Inn and Chappel Viaduct – 32 arches spanning a length of approximately 1,136 feet providing the railway line which links trains from London Liverpool Street via Marks Tey. The nearest railway station is Wakes Colne and Chappel. One stop away is Marks Tey connecting to London/Liverpool Street within 60 minutes. There is an accessible taxi service available Tel: 07777 692785. There is a regular bus service from The Street, Wakes Colne (1.25 miles walking distance) providing an hourly service to Halstead and Colchester (No 88 Bus). A local convenience store at Wakes Colne and Chappel is open 7 days a week. The Co-op is available at Earls Colne. Larger supermarkets include Sainsbury’s at Stanway, Sudbury and Halstead and Waitrose in Sudbury. The Good Food Company is a high end deli in Marks Tey (20 minutes’ drive) and is also well worth a visit. You can also get your shopping delivered to the lodges if you’d prefer to have Waitrose come to you during your stay. Farm shops include Blackwells in Coggeshall (4 miles), Assington Farm Shop in Sudbury (8 miles) and Greenstead Farm Shop in Greenstead Green (5 miles). Rambling country houses, historic landmarks, striking contemporary galleries – all combine to make Essex a truly memorable place to soak up centuries of the county’s creative spirit. Next door to firstsite, this beautiful listed Georgian building is home to Colchester School of Art’s public gallery and showcases a range of contemporary art. It also includes an excellent café surrounded by a walled garden (9 miles). Wivenhoe (13 miles) with its quiet quayside, was an artists’ colony in the 1950s. Painter Francis Bacon and photographer John Deakin both made their homes here, while later names have included primitive painter Ernie Turner and James Dodds, famous for his linocuts. Lit by constantly changing East Anglian skies, the county’s rolling rural landscapes and beautiful fretted coastline have long been an inspiration to generations of artists. Most famous is John Constable whose rustic idylls are forever associated with the gentle Stour Valley north of Colchester. The village of Flatford (18.5 miles) lies in the heart of Dedham Vale and was the inspiration for many of Constable’s famous works. 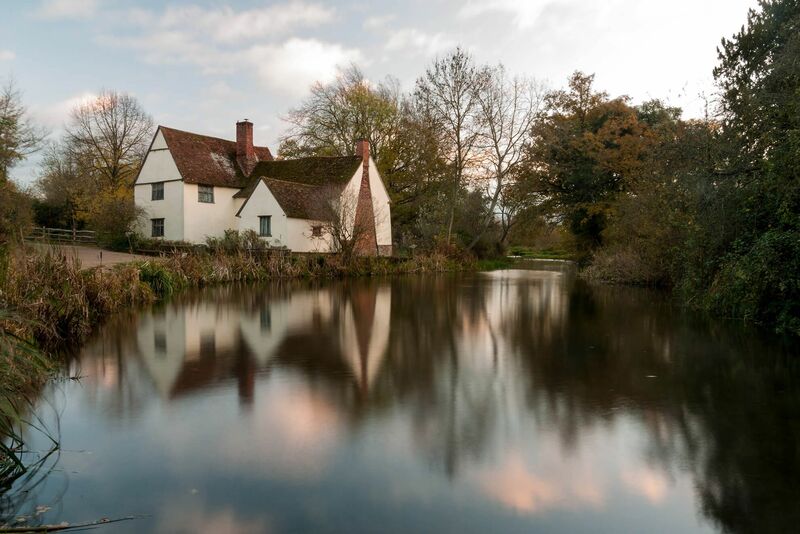 It remains unchanged to this day and you can still explore the white cottage (which belonged to Constable’s neighbour, Willy Lott); Flatford Mill, which was owned by the Constable family; and Bridge Cottage, which houses an exhibition of Constable’s work. 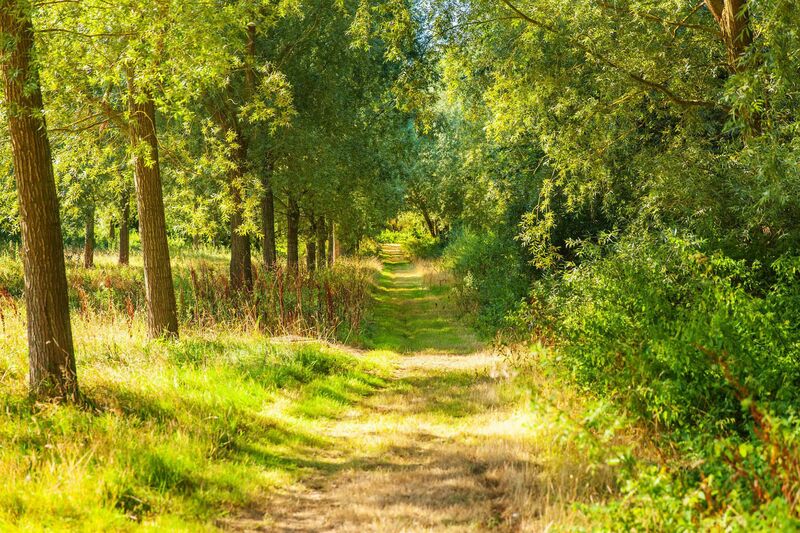 Or set off on a lazy row through meadows grazed by silent cattle and drink in scenes little changed since he painted them. The rowing boat companies in Flatford and Dedham are dog friendly - your pooch is allowed on your boat under your own responsibility. 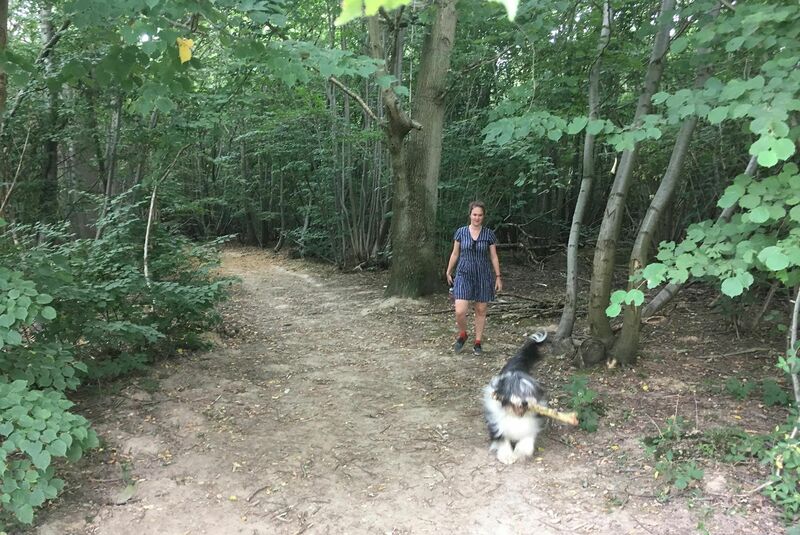 Two signposted walking trails also allow you to get the most out of your day or you can join an organised walk. Just upstream, colourwashed Dedham Vale (15 miles) is another of the celebrated paintings by John Constable, which depicts a scene from what is now the Dedham Vale and Stour Valley Area of Outstanding Natural Beauty. 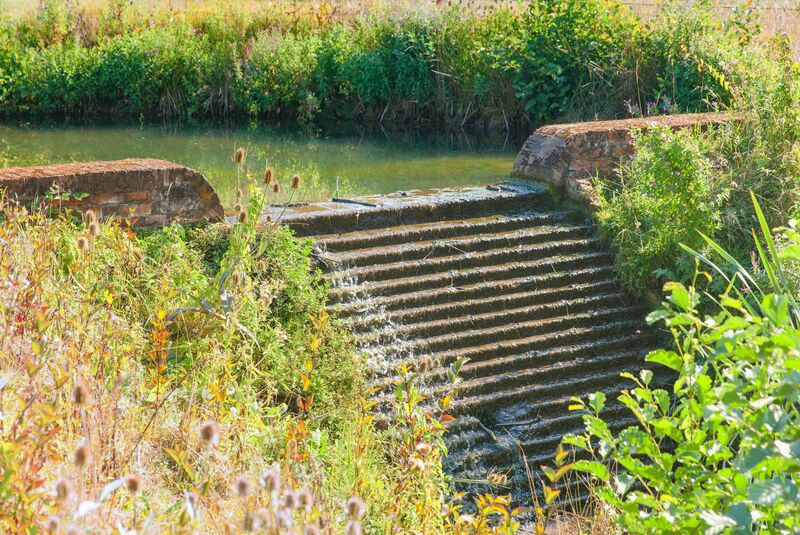 You can explore this stunning landscape on foot via one of the many Dedham walks, following the valley through picturesque villages such as Flatford, Dedham, Stratford St Mary and Stoke-by-Nayland. 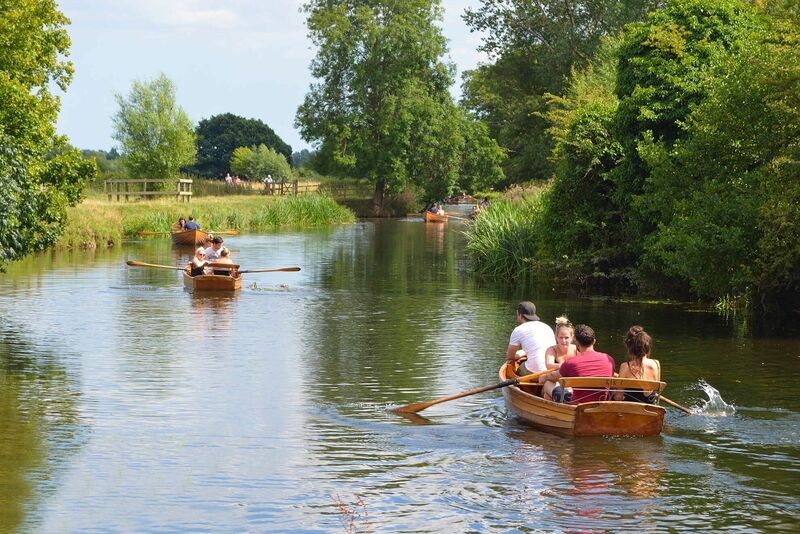 Alternatively, you could see Constable Country from the water, by renting or boarding a boat at one of several places along the River Stour. Did you know that Essex is one of the top wine-producing regions in the country? Carter’s Vineyards, Boxted (10 miles) – take a tour around the vineyards rounded off with a tasting of their award-winning wines – you’ll soon appreciate why. Dedham Art and Craft Centre (15 miles) and Blake House Craft Centre (16.5 miles) offer a range of craftsmen and specialist shops in beautiful historic settings selling everything from original art to handmade jewellery. Over 14,000 listed buildings also make the country a renowned hunting ground for lovers of antiques. 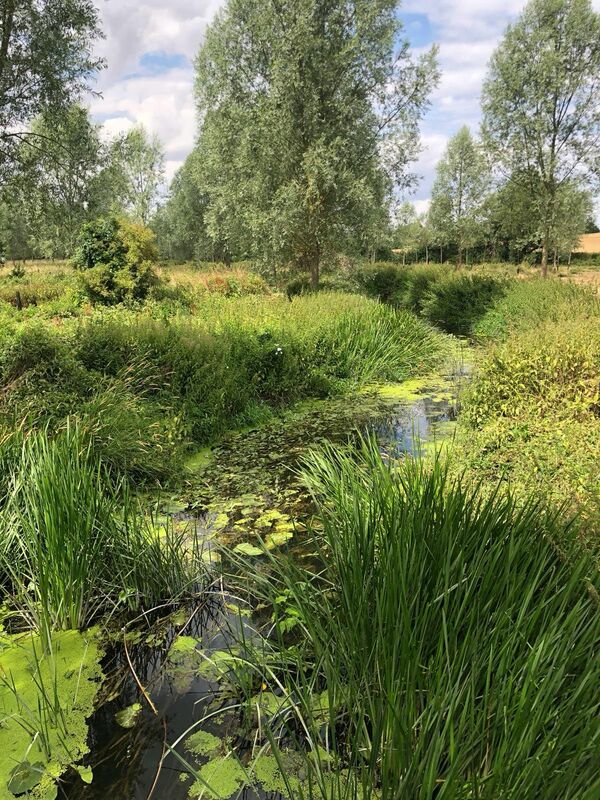 Browse the antique shops in Coggeshall and Long Melford, or potter around the Halstead Antiques Centre, which straddles the river in Halstead. Debden Barns (30 miles) is housed in a 17th century barn outside Saffron Walden or, on a larger scale, hop over to Battlesbridge (30 miles), the biggest antiques centre in Essex, housing over 80 dealers. COGGESHALL (6.5 miles). 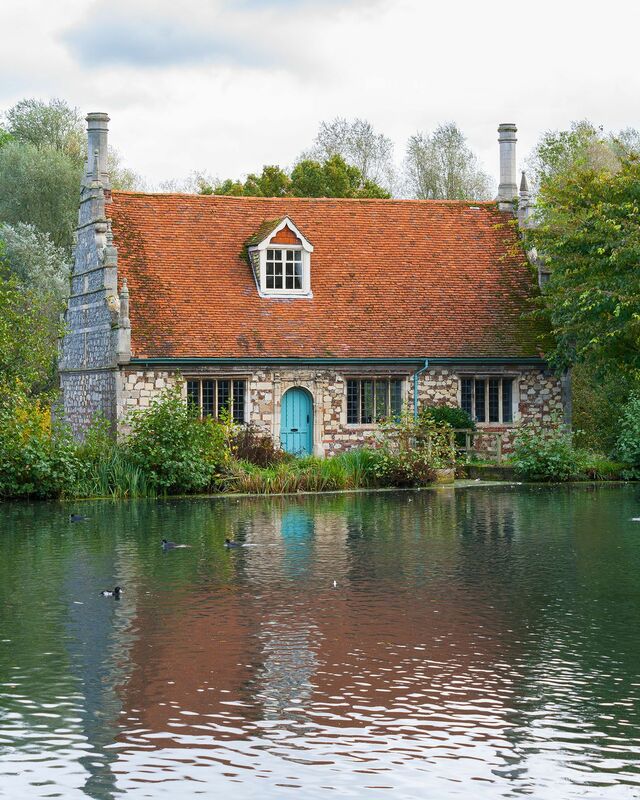 Enjoy a history-filled day in the pastel-washed village of Coggeshall, bristling with antique shops – it was a location in the Lovejoy TV series. It’s packed with medieval and Tudor buildings including the ornate Paycocke’s merchant’s house (NT) and 13th century monastic Grange Barn (NT). Market day is Thursday. COLCHESTER (9 miles) can be reached in just under 20 minutes and offers a wide variety of shops including a Fenwicks. There is a wide range of activities for all ages from Colchester Zoo to the Roman Castle. CASTLE HEDINGHAM (10 miles). You can see Hedingham Castle for miles around, its sturdy Norman keep, the best-preserved in England, standing guard over the village. Climb the spiral staircase and soak up the atmosphere and stroll around the pretty village. Nearby is the Colne Valley Railway, where you can enjoy a ride on a restored locomotive. 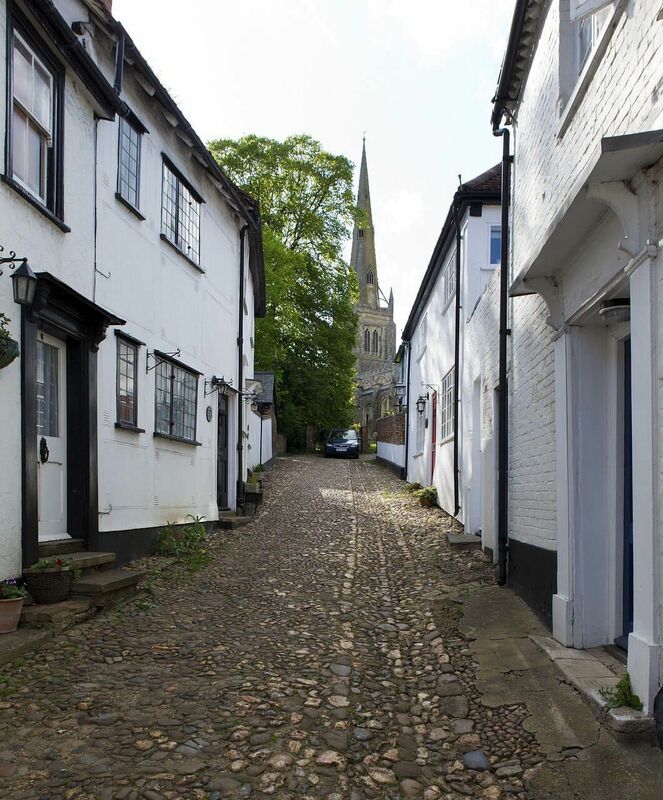 SUDBURY (10.5 miles) is a pretty and ancient market town (market day Thursday and Saturday). Well known for its natural beauty, Thomas Gainsborough was born here and the surrounding countryside inspired much of his work. There are a wide variety of shops on offer (some may strike familiar from the Lovejoy TV series). Attractions include Gainsborough’s House and The Quay Theatre. LONG MELFORD (13 miles) has the longest high street in Suffolk with antique shops, cafes, boutiques, restaurants and Tudor mansions. There are several tea rooms and pubs that welcome dogs too. Melford Hall and Gardens is nearby. 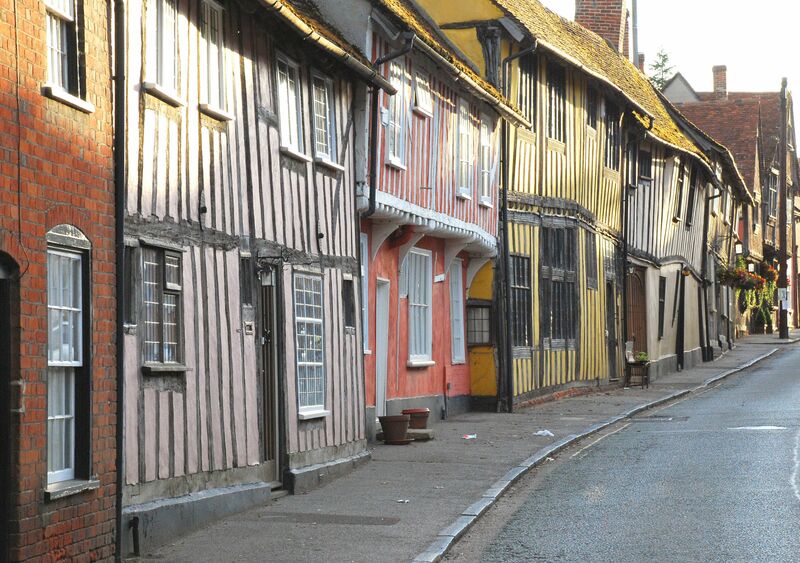 LAVENHAM (16 miles) is considered England’s finest complete medieval village with over 350 timber framed medieval houses and its magnificent church of St Peter & St Paul. Located in some of these medieval buildings you will find delightful shops, art galleries, tea rooms, good pubs and a number of Michelin starred gourmet restaurants. 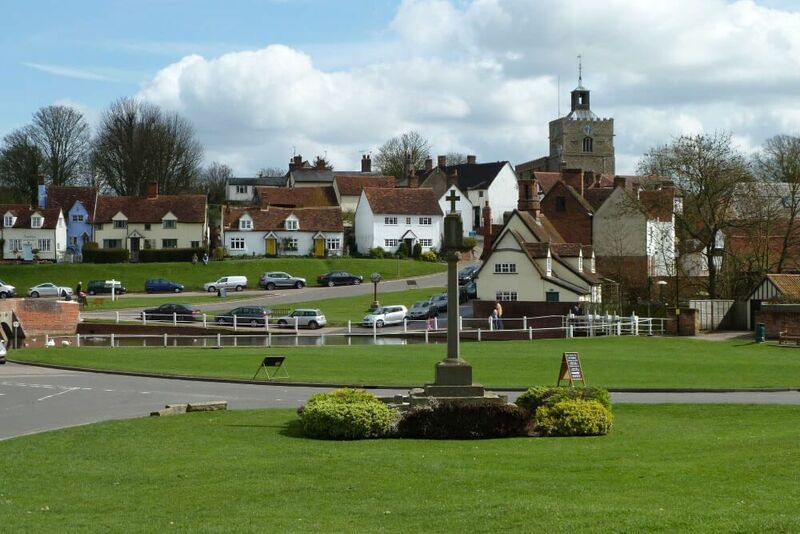 FINCHINGFIELD (17 miles) is the most photographed village in England, appearing in films and TV programmes. It’s the perfect place to bring along a picnic and drink in the views. 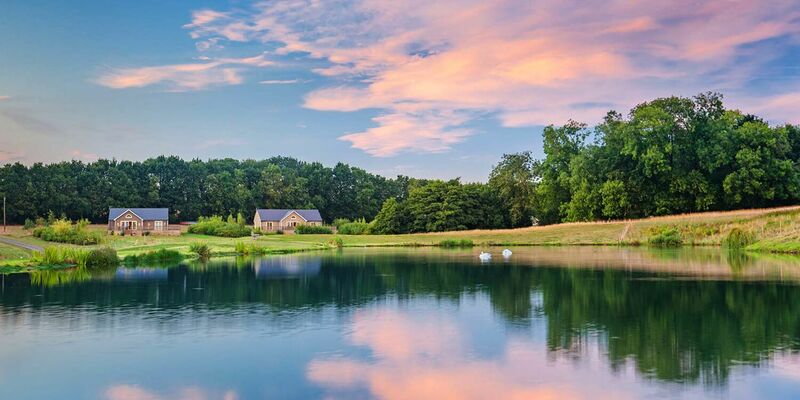 The combination of duck pond and village green presided over by colour-washed cottages, windmill and medieval church, lend this quintessentially English village an unbeatable series of vistas. CHELMSFORD (23 miles) is under 40 minutes’ drive time and has a first class shopping centre including a new John Lewis. TOLLGATE Retail Park at Stanway (6 miles) is a large out of town retail park. There is a Multiplex Cinema (Cineworld) at Freeport, Braintree (11.6 miles). Alternatively drink in the watery views on the riverside path from Britain’s oldest recorded town, Colchester to the quay at Wivenhoe, a pretty fishing town that has inspired a wealth of contemporary artists and writers including James Dodds and Martin Newell. 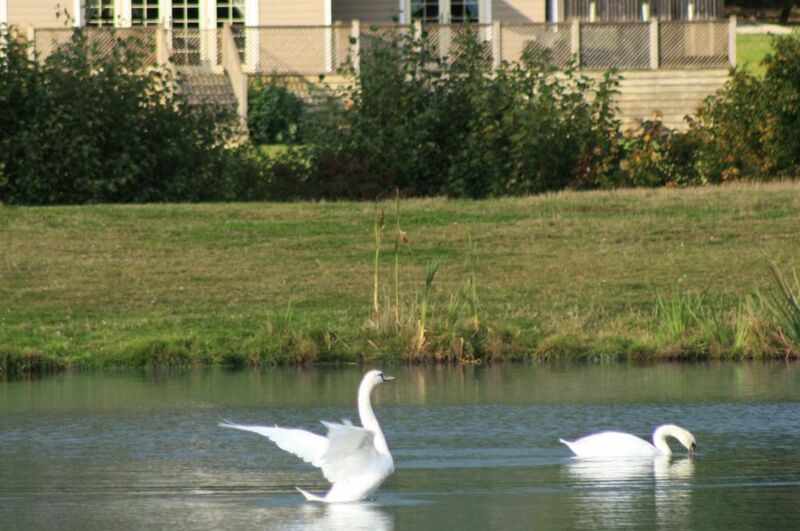 Enjoy some relaxed fishing in the well-stocked two-acre private lake on site. 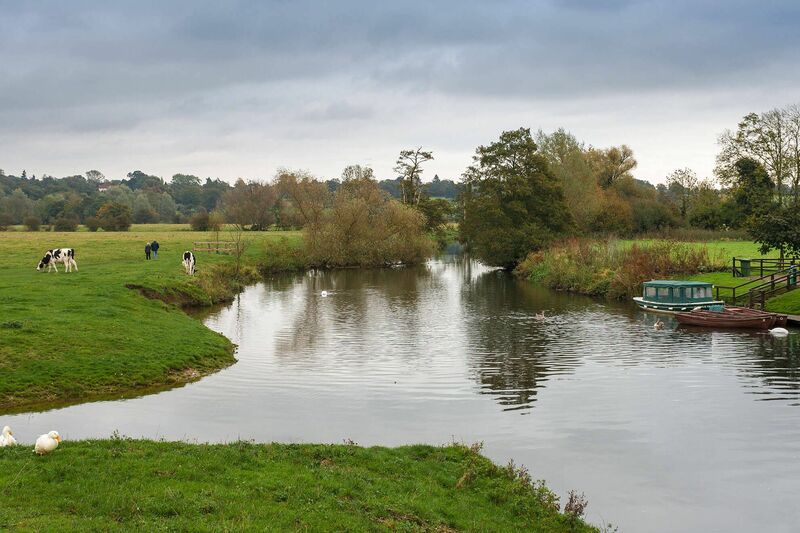 It is well stocked with carp and rudd and has plenty of places for keen fishermen and women to set up their tackle. To fish on the private lake at the lodges you need to have a fishing licence and to bring your own fishing equipment. For a round with a view head for Stoke by Nayland Golf Club (10.5 miles), with its two championship courses set in glorious Constable Country. Crowne Plaza Five Lakes Resort (14 miles). With its two contrasting courses used for championship events, it’s the perfect place to relax with friends over a friendly game. The longest of any county in England, Essex’s coastline stretches for over 300 miles, each mile as diverse as the county itself. With its zinging floral displays, watersports and quirky road train, Clacton-on-Sea (26 miles) is a family favourite and home to a prestigious Blue Flag as well as Clacton Pier, crammed with rides and amusements. The pier is the perfect spot from which to spectate one of the county’s most popular events, the Clacton Air Show (August), with its daring aerobatic displays and stalls. 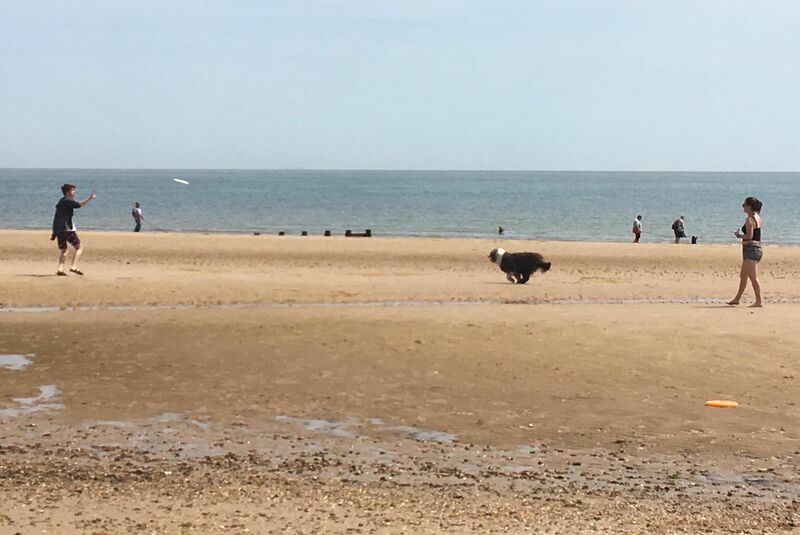 Quieter Frinton and Walton also boast beautiful beaches and a pier and are close by. If you like your seaside with a dash of history, Harwich’s narrow medieval streets (27 miles), designed to prevent the winds blowing through the town, are crammed with over 200 listed buildings. This maritime town has played a vital role in our national history. Stroll along to Ha’penny Pier, with its shifting vista of vessels, and follow the Maritime Trail, past attractions like the Redoubt Fort and Maritime Museum, housed in the Low Lighthouse, to find out more. Alternatively head for the historic seafaring town of Maldon (19 miles), home to the iconic Thames Sailing Barges, which once ferried goods along the east coast to London. Once a fleet of over 2,000, today only a handful survive. A cruise from Hythe Quay allows you to fully appreciate the beauty of these fine old vessels while drinking in the estuary views. 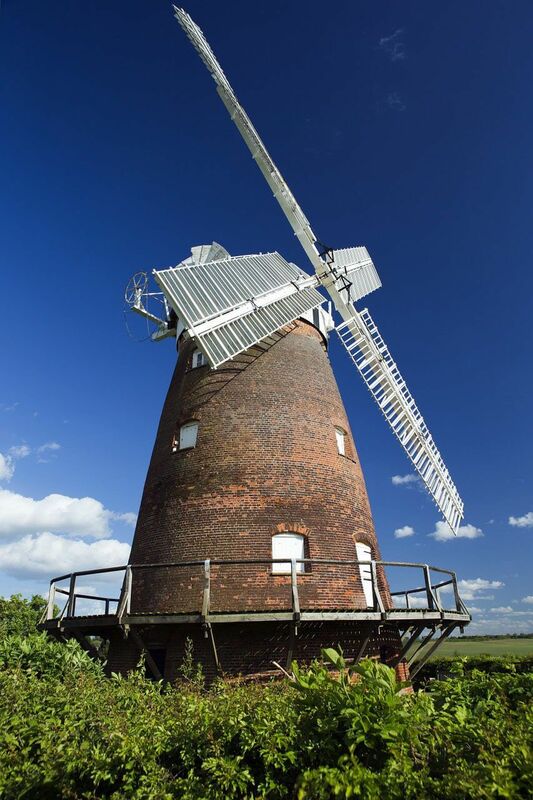 Maldon also boasts several fascinating museums (see above) plus the Promenade Park, perfect for outdoor play on a hot summer’s day and you can round off your day with fish and chips on the promenade. Try out too some of the county’s other coastal culinary delights. Shellfish is a particular speciality, harvested from the rich belt of reclaimed marshes and mudflats that creep along the county’s shoreline. Head for West Mersea (17 miles) where you can tuck into a tray of oysters at one of the island’s popular seafood bars. Pantomime at Mercury Theatre, Colchester (9 miles). Essex Game and Country Show, Cressing Temple Barns, Braintree (Late March) (12.5 miles). Chappel Winter Beer Festival, East Anglian Railway Museum (1.5 miles). The Great Dedham Vale Vineyard Easter Egg Hunt (10.5 miles). Maldon Mud Race, a wild and wacky sprint through the thick mud of the Blackwater estuary (19 miles). English Wine Week, Dedham Vale Vineyard (10.5 miles). Classic Car Rally, Dedham Vale Vineyard (10.5 miles). Colchester Food and Drink Festival, Lower Castle Park, Colchester (9 miles). Colchester’s Medieval Oyster Fayre, Lower Castle Park, Colchester (9 miles). 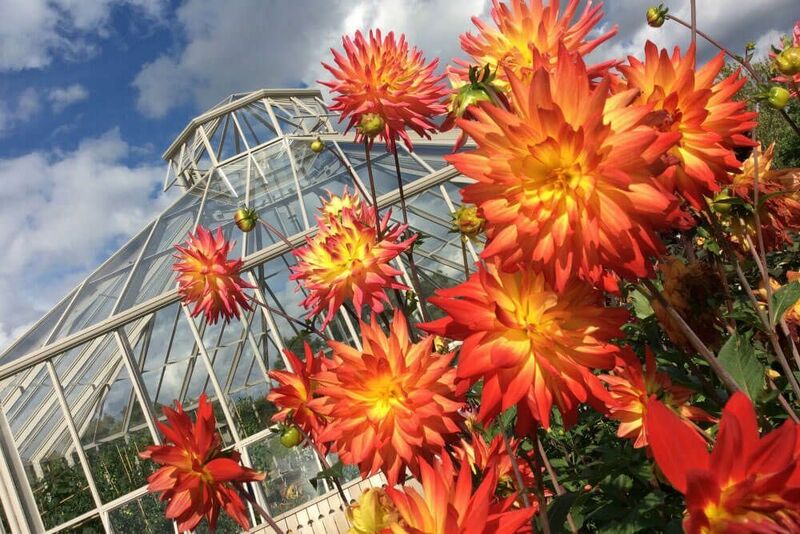 Essex Flower and Garden Show, Cressing Temple Barns, Braintree (12.5 miles). Thaxted Morris Men Weekend of Dance (23 miles). Classic Car Day, Layer Marney Tower (11 miles). Essex Festival of Food and Drink, Cressing Temple Barns (12.5 miles). Clacton Air Show , Clacton-on-Sea (25 miles). RHS Flower Show at Hyde Hall Gardens (28 miles). Cider & Wine Festival, Dedham Vale Vineyard (10.5 miles). Classic Cars, Hedingham Castle (10 miles). Dredging the First Oyster, Colchester (First Friday) (9 miles). English Wine Festival, New Hall Vineyards (23 miles). Chappel Summer Beer Festival, East Anglian Railway Museum (1.5 miles). 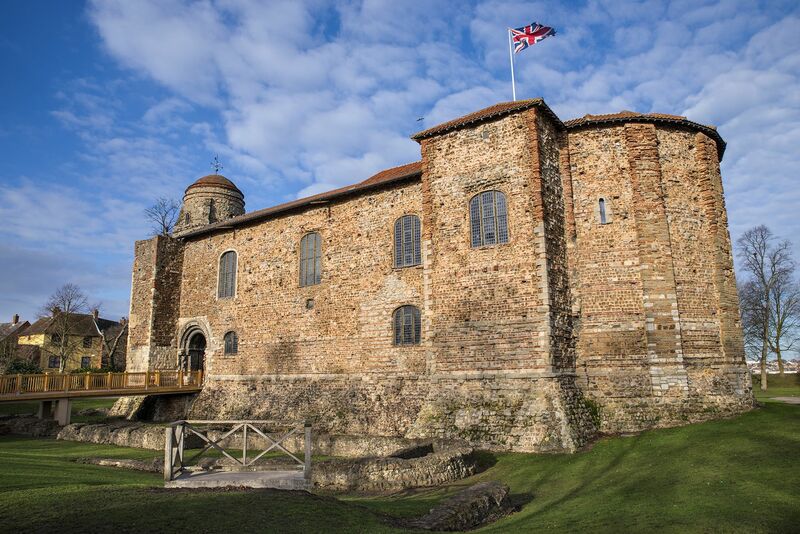 Halloween events at Colchester Castle Museum (9 miles). Halloween events at Colne Valley Railway, Castle Hedingham (11 miles). Oktoberfest, Castle Park, Colchester (9 miles). Fright nights at Colchester Zoo (9 miles). Halloween at Hedingham, Colne Valley Railway, Castle Hedingham (11 miles). Colchester Oyster Feast, Colchester (9 miles). Colchester Film Festival at Firstsite, Colchester (9 miles). Starlight nights at Colchester Zoo (9 miles). 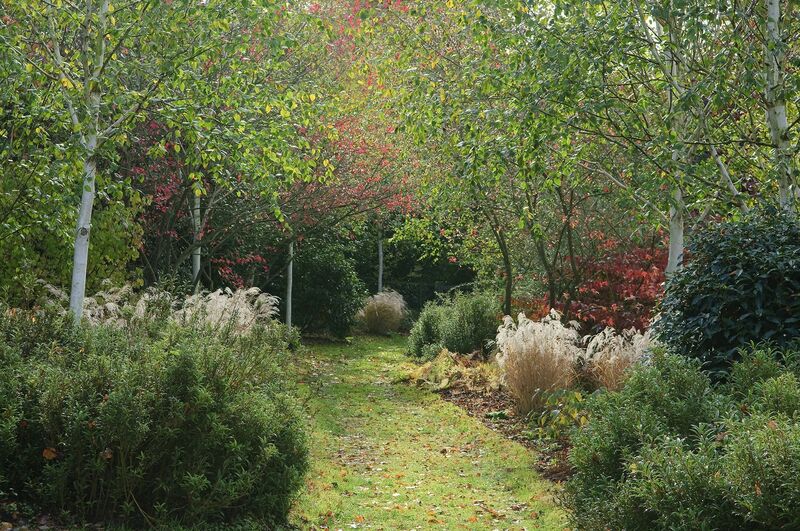 The Beth Chatto Christmas Fayre, Beth Chatto Gardens (14 miles). Pantomime at the Mercury Theatre, Colchester (9 miles). Steam with Santa, Colne Valley Railway, Castle Hedingham (11 miles). The Magic of Christmas at Colchester Zoo (weekends) (9 miles). Christmas Starlight nights at Colchester Zoo (9 miles). Meet Santa at his Colchester Castle Grotto (9 miles). Colchester Christmas Fair, High Street, Colchester (9 miles). Pantomime at the Quay Theatre, Sudbury (mid December – January 1) (10.5 miles).